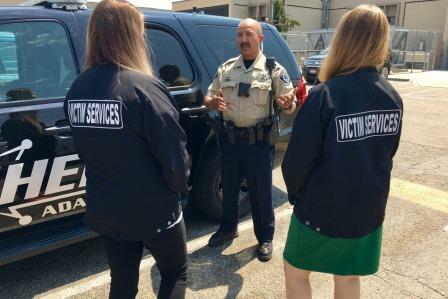 The Ada County Sheriff’s Office Victim-Witness Coordinators help victims, witnesses and survivors of serious crimes. They provide immediate crisis intervention and serve as an advocate for the victim and witness. Victim-Witness Coordinators help victims understand and navigate the criminal justice system, facilitate their participation with the judicial process and accompany victims to court. They feel strongly about preserving the dignity of victims and strive to treat them with compassion and respect as they go through an often emotional or intense situation. Our coordinators also work closely with Family Advocacy Center & Education Services (FACES), a community center which provides services for families and individuals affected by child abuse, domestic violence, stalking, and sexual assault. FACES provides a dignified and respectful environment for those affected by these crimes through a proactive, team-oriented, and victim-centered approach. Assistance with Crime Victims’ Compensation, restitution, safety planning, VINE registration, protection orders, and shelters and emergency hotlines.